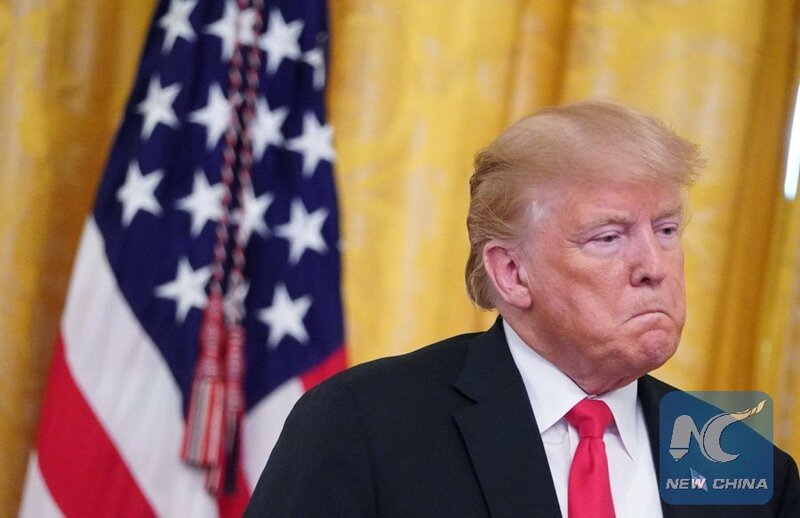 WASHINGTON, Sept. 5 (Xinhua) -- U.S. President Donald Trump continued his attacks Wednesday on an explosive book about his administration. Trump said the book, written by U.S. veteran investigative journalist Bob Woodward, "means nothing" and called it "a work of fiction" during a photo op with visiting Kuwaiti Emir Sheikh Sabah Al-Ahmad Al-Jaber Al-Sabah at the White House. Woodward's book -- "Fear: Trump in the White House" -- is to be released next week. According to excerpts obtained by media outlets, Trump's aides describe him as a "liar" and an "idiot" who is running a "crazytown." "Isn't it a shame that someone can write an article or book, totally make up stories and form a picture of a person that is literally the exact opposite of the fact, and get away with it without retribution or cost," Trump tweeted earlier in the day. In a statement to The Washington Post, Woodward said, "I stand by my reporting." The book was based on hundreds of hours of conversations with direct players, according to the author. Woodward has been a reporter at the The Washington Post since 1971 and remains an associate editor there. He is most famous for breaking the story of the Watergate scandal, which promoted the resignation of Richard Nixon from the presidency in 1974.